Mirepoix is a town in the Ariege department of the Midi-Pyrenees near the border with Languedoc-Roussillon and between Carcassonne and Foix. 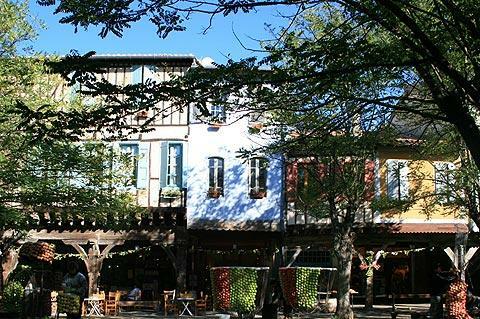 It is a beautiful medieval bastide town and Mirepoix should not be missed if you are in this area. Mirepoix started life on the other side of the River Hers but following a terrible flood in 1209 which wiped out many of the villages in the area the town was rebuilt on the opposite bank. 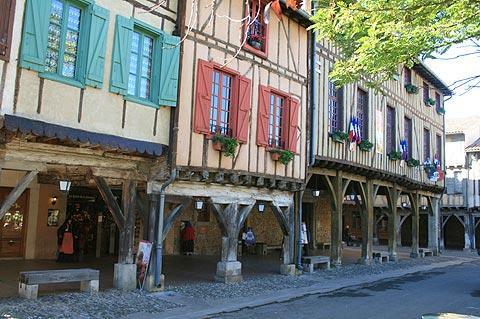 Mirepoix suffered during the Hundred Years War but then became an important textile centre in the 15th century. 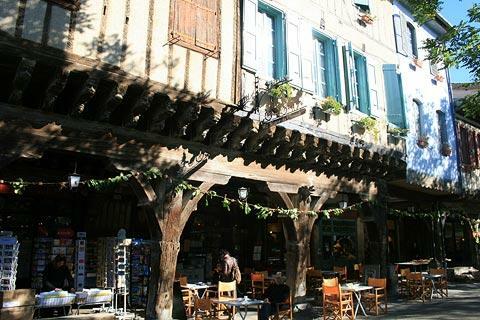 The highlight of this ancient bastide town is the central square - the Place des Couverts - which is surrounded by medieval houses and arcades (the covered walkways in front of the shops). The square is absolutely beautiful and very colourful as the timber-framed houses are painted in a variety of pastel shades. 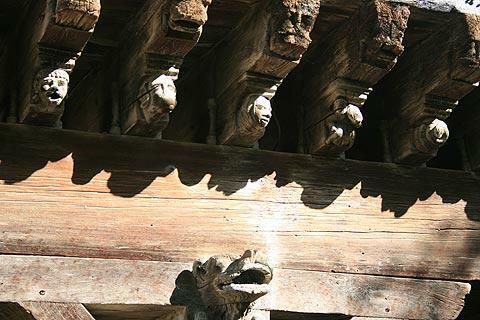 Take some time to admire the woodwork involved in these houses - some of the carpentry and decorative features have fascinating details. The 'Maison des Consuls' is one of the best of these buildings. 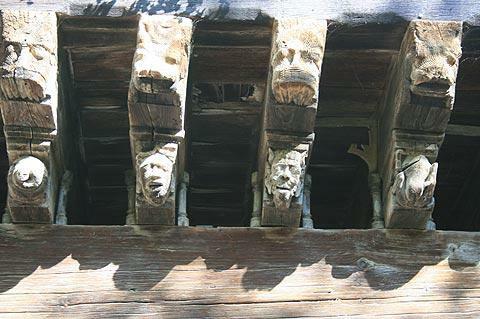 Have a look at the carved figures on the ancient woodwork which include African heads, women’s heads and a tortoise: there are an incredible 103 carvings in total! Over at the other end of the square is Mirepoix tourist office in another one of the lovely buildings. Look outside the tourist office for the two grain measures dating from the 17th -18th century which hold 20 litres of grain each. 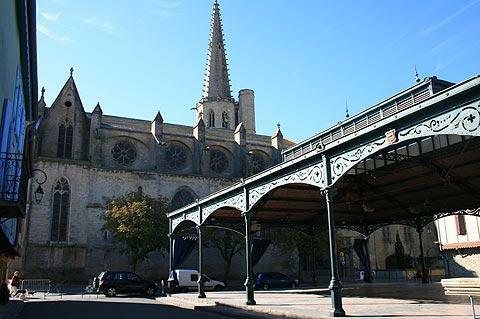 There is also a wrought iron market hall in the centre of the square, built in the 19th century. The cathedral in Mirepoix, the cathedral of Saint Maurice, is a gothic style cathedral. It is the second largest single-naved church in Europe and is a classified Historic Monument. Built on to the cathedral’s walls is the former bishop’s palace. The palace was built in the 16th century by the bishop of the time who wanted to live closer to the centre of town! On the edge of town you can see the Porte d’Aval which is a 14th century fortified gate and all that remains now of the towns fortified walls which once enclosed the town. Market day in Mirepoix is a Monday. 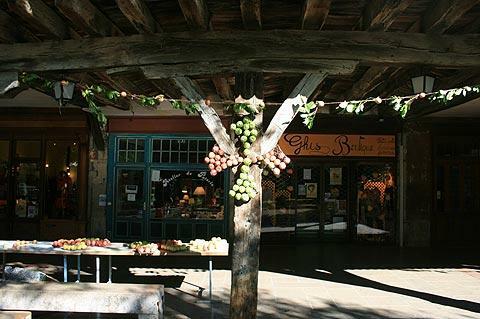 We were lucky enough to arrive in Mirepoix as it was getting ready for its annual apple festival. Each year in October there is a different theme and this year it was music and so apples were used to create giant guitars and drums. Apples were also strung like streamers all around the square. It looked great. We weren’t unforunately there for the fair itself but on the Sunday - festival day - there are all manner of apple based things sold including freshly squeezed apple juice, tarte au pomme and toffee apples. Note: the name Mirepoix is also used for a crucial ingredient in French cookery including carrots, onion and celery and acting as the base for many recipes. The name derives from an 18th century Duke of Mirepoix who invented the recipe. Nearby to Mirepoix, don't miss a visit to the small but lovely little village of Camon a few kilometres to the south-east. Also near to Mirepoix, but in the other direction, is an unusual little church at Vals. The Saint Mary’s rock church has been partly built into the rock and so is quite unusual. Inside are some 11th century wall paintings which are soon to undergo restoration. Slightly further afield you will certainly want to visit the incredible historical fortified town of Carcassonne to the north-east of Camon, and you will also enjoy exploring Foix, overlooked by a castle and to the south-west of here. You can find more local travel ideas in the Ariege guide and the Midi-Pyrenees guide.